Murray Smith is arguably one of Western Australia’s most well known surfing identities. Born in 1944, Murray grew up in Scarborough Western Australia and in his time went on to become one of the state’s most coveted surfers. In the inaugural year of the State Open Division title held at Yallingup in 1965, Murray came third but went on the next year to claim the state 1966 Open division title. Over the years he was placed in numerous state championships winning places in the Open, Senior and Masters Divisions. This followed with the Australian Championships where he was placed in many divisions, culminating with the 1980 Australian Masters title. 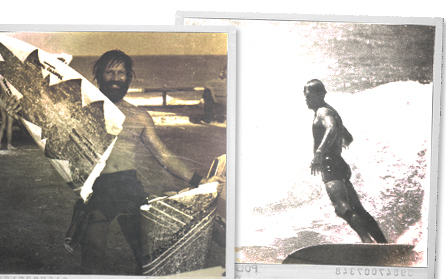 Like a lot of surfers at the time, Murray started shaping surfboards for himself and friends. His first official job as a shaper was at Hawke Brothers in Osborne Park and from there he left to start his own business shaping from a side room at his parent’s home at the beachfront in Scarborough. Later, after his marriage in 1973, he re-located his passion to a garage at the front of his house in Scarborough. As the business grew in popularity there was a chronic shortage of space and so Murray opened a factory in Churchlands (next door to Herdsman Growers Market). At the time windsurfing and wave-skiing were also gaining in popularity and so a thriving business was born. Adan Nicolson came on board in the early years and a little later Phil Usher. ‘Devo’ Darren Howard revolutionised the type of sprays on boards along with Andrew Hunter and in the 80′s, the Murray Smith Factory became a mecca for surfers wanting surfboards, windsurfers, wave skis and bodyboards. During that time Murray mentored and supported many aspiring young surfers including Dave Macauley, Mat Manners, Stuart Bedford-Brown, Mitch Thorson and Josh Palmateer, some of whom went on to surf the world circuit. Noted surfboard shapers who started doing ding repairs and odd jobs in the factory at Churchlands included Mat Manners, Dave Macauley, Phil Usher, Adrian Sheppard, Dave Lewis and Benton Moran. From the original factory in Churchlands, Murray and his wife Connie went on to open four retail outlets in Scarborough, Cottesloe, Fremantle and Busselton and later an outlet store in Osborne Park. When Murray decided to retire, all stores were sold except for the outlet store at Osborne Park which is still run by Connie and son Ben. Murray has retired to Yallingup for the summer and Exmouth for the winter and can be seen surfing on most days when the swell is up! In 1999, an award dedicated to the Western Australian Junior Surfer of the year was named in Murray’s honour. In 2008, Murray and Connie were acknowledged by the West Australian Surfing Association for services rendered to the industry over a period of nearly 50 years.